3GNY is introducing @3GStories, a digital collection of memories and tributes to our grandparents who survived the Holocaust. 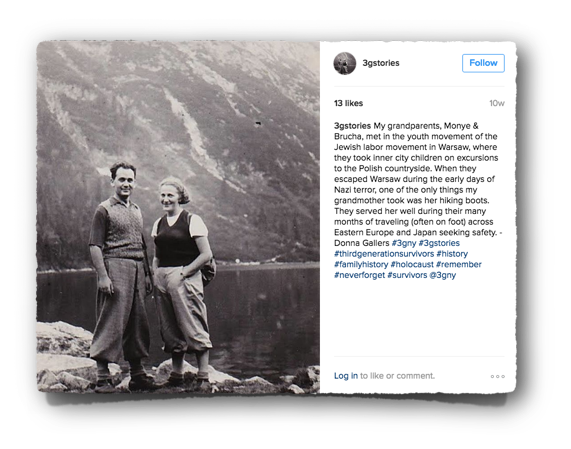 3GStories is our very own “Humans of New York” style Instagram and Facebook feed, with the goal to have enough submissions to upload a new photo weekly and build this to be a digital archive of Holocaust survivors and their stories. Join us as we launch this exciting new initiative and to learn how you can contribute your family story. We will be serving wine, cheese, and other snacks. Please contact events@3gnewyork.org with any questions about events.